Specifications: blades 24" notched or smooth edge, 1 1/8" gang rods, Cat I hitch, triple sealed bearings with wear guards, 9" spacing with cast iron spools, sizes 6'4" to 8'0". Weights from 1640 to 2155 pounds. Options: blade cleaners, dirt shields, rear utility hitch, rear tool bar extension and add a blade extensions. 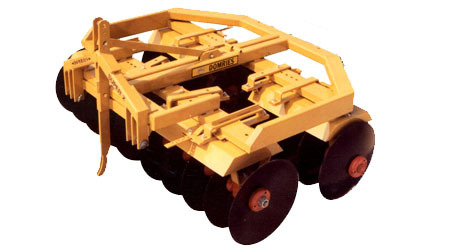 Features: the reversible 3 point A frame hitch can be removed and installed on the rear of the machine, providing three different tillage operations, regular disking, reverse disking or flat furrowing and is done with no tools required. Simply remove and reinstall pins.